This box of 20 individual peel and stick luggage labels are suitable for scrapbooking, decoupage, gift wrapping and, of course the adornment of old trunks and luggage. This box of 20 individual peel and stick luggage labels are suitable for scrapbooking, decoupage, gift wrapping and, of course the adornment of old trunks and luggage. 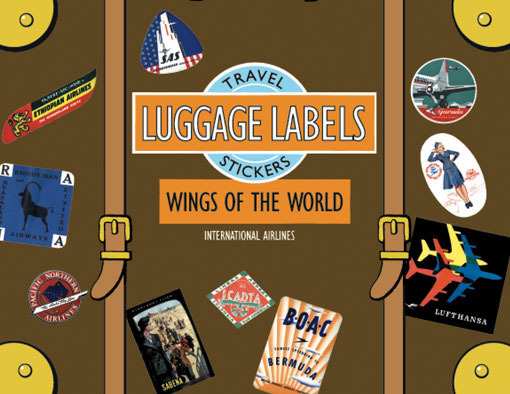 Despite their relatively brief history, airlines have produced some of the most pleasing of all luggage labels. Their designs are bold, with a modern sensibility. We have selected for beauty, rarity, and variety, and include labels from the airlines Garuda, Scadta, Ethiopian, Jersey, Lot Roumanian and Cubana, as well as labels from larger and more familiar carriers such as B.O.A.C. and Lufthansa.